Curved displays in electronic gadgets are presently in vogue and in high demand. Back in July 2014, Samsung launched curved screen of size 105-inch 4K TV for a whopping amount of $129,000. This amount is surely for few people and the large number of people who aspire but cannot afford were left in eager wait. Finally the wait is over and Samsung has brought a modest version of curved display with different specifications. 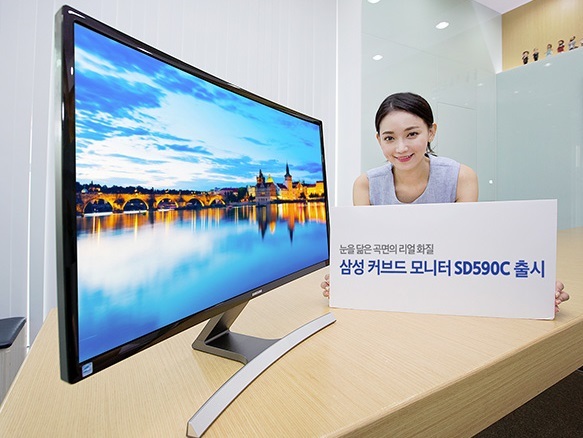 The name of the display is S27D590C. The device is certified for quality and performance from US-based companies like Underwriters Laboratories and Germany’s TUV Rheinland. The monitor will be priced at 469,000 Korean won which approximates to $450 USD. Are Android One, Moto E and Xiaomi Redmi 1s heading towards a tough fight?